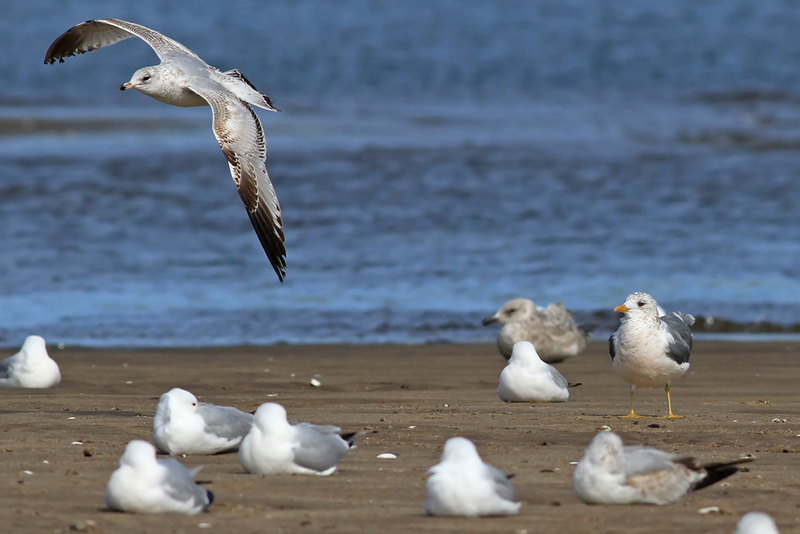 The winter/spring of 2014-15 has been a fascinating one for Mew Gulls in the northeastern United States. 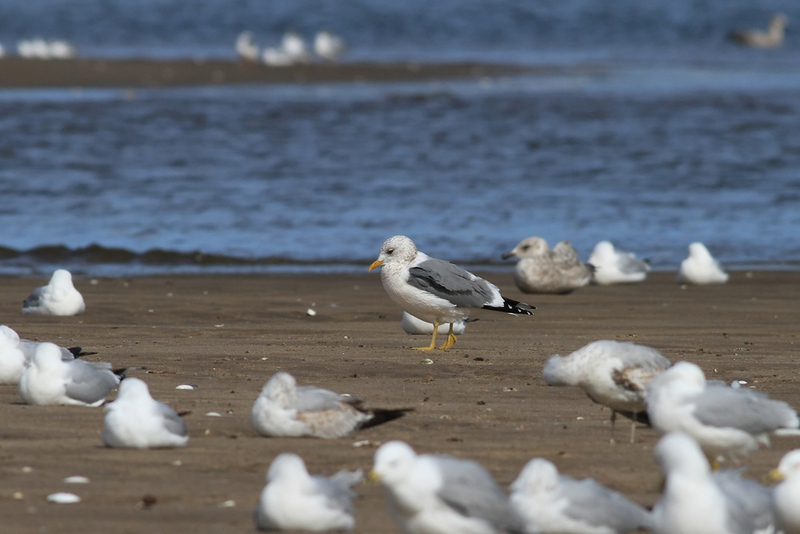 In addition to a few "Common" Mew Gulls (Larus canus canus, from Europe), which has traditionally been the expected form in the region, there have been one or two "Short-billed" Mew Gulls (L. c. brachyrynchus, from NW North America) in coastal New York, a very convincing "Kamchatka" Mew Gull (L. c. kamchatschensis, from NE Asia) candidate in Massachusetts, plus a couple of more confusing individuals as well. 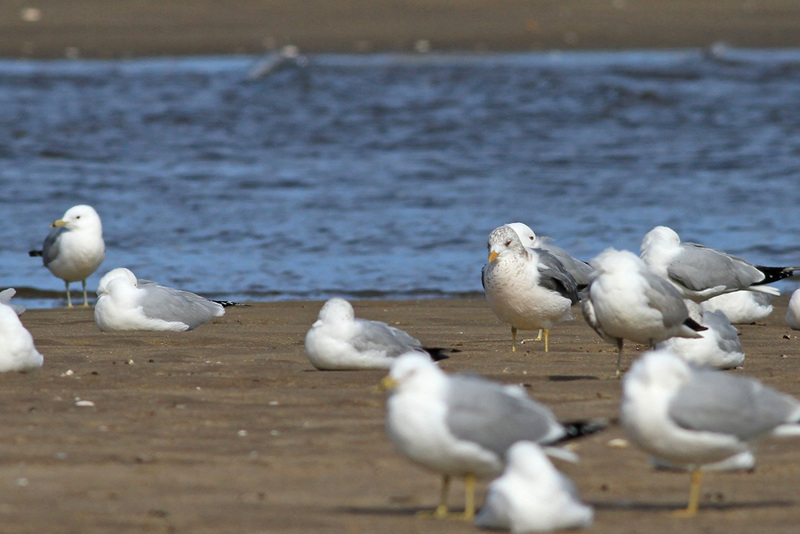 With any form of Mew Gull being rare in these parts, these birds tend to be closely scrutinized whenever found. 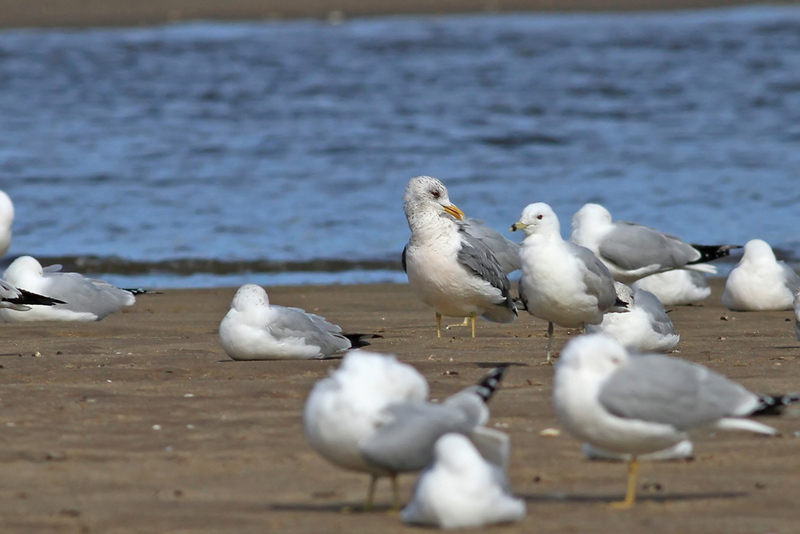 It is obvious that we are getting Mew Gulls from all different directions around here, which makes the process of identification even more challenging and ridiculously interesting. 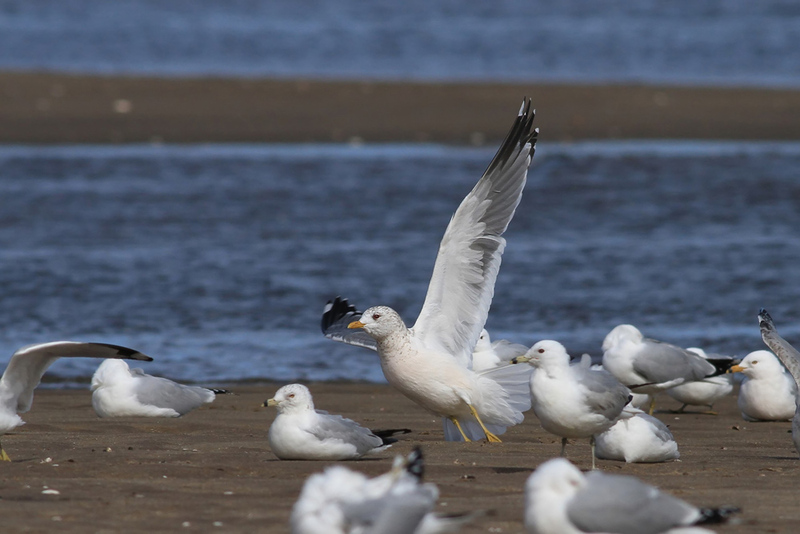 Case in point, on April 10th Mayn Hipp and Mike Warner located an adult Mew Gull at Southport Beach, CT. Mayn obtained some nice images through the fog, which he has posted on his Flickr account. The bird was not seen after that brief encounter despite heavy gull-watching on subsequent days. Yesterday afternoon while combing through the gulls at Oyster River on the West Haven/Milford line, I stumbled across the same bird. Oyster River is 18 miles in a straight line from Southport Beach. My photos and description are below. To me, this bird's origins are most likely [east] Asian. Whether that means L. c. heinei (the central Asian breeding form) or L. c. kamchatschensis I do not know. Input from those who have spent more time on this would be greatly appreciated. 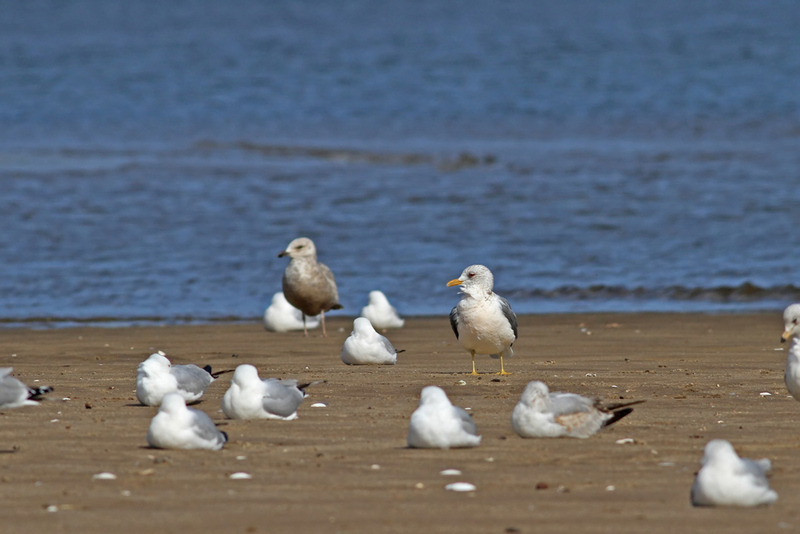 Subspecific Mew Gull ID can be perilous, especially considering that the Old World forms interbreed where ranges meet. There is much we (or at least "I") still do not know about these birds. 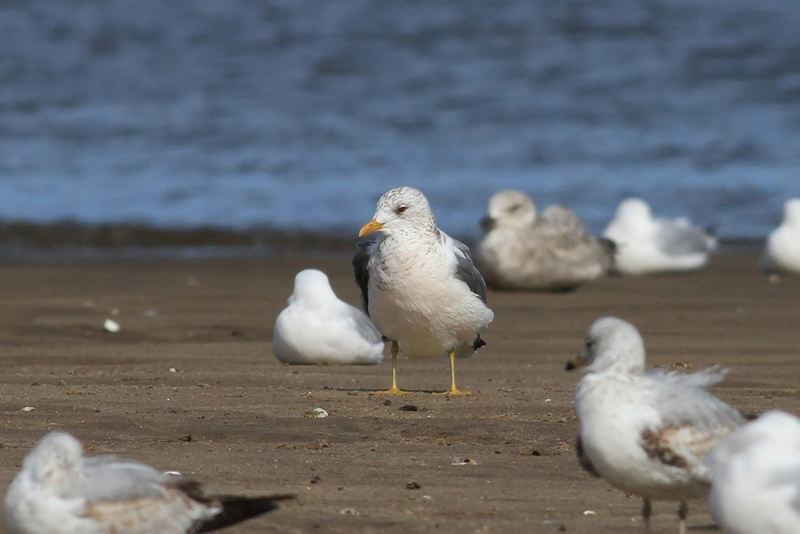 - A very dark-backed bird, perhaps just a shade or two paler than graellsii Lesser Black-backed Gull, and with a bluer tone. Broad scapular and tertial crescents. - Underparts on this bird were washed with salmon, as are the underparts of several small-medium gulls at this time of year, though it is particularly intense on this bird in the right light. - Bright yellow legs and feet. - Bright, unmarked, evenly yellow bill. My impression of bill structure varied with the bird's angle, but overall struck me as, for a "Mew" Gull, of average length yet rather stout. - Very dark brown iris showing subtle contrast with black pupil. - Dark smudge in front of the eye that enhanced the dark-eyed look in the field. The head was rather densely marked with short streaks, particularly on the crown. The densest markings were on the nape, and the markings extended onto the breast to form a cowl. The markings on the breast were widely spaced, coarse, generally horizontal lines. - Upperparts in flight: there is a broad trailing edge that tapers considerably at the inner primaries. There is extensive black on the outer primaries, including p8, and there is some black on the outer primary coverts. There is a moderate-large white mirror on p10, a tiny pinhole of a mirror on p9 (on left wing only; lacking on right ring), a significantly black p8, white tongue-tips to p7-5, a broken black band on p5, and no black markings on p4-1. - The underwing is tricolored: white wing linings, medium gray remiges with black in the outer primaries. As the bird soared high and to the south with RBGUs, its dark underwing was distinct at a great distance, recalling that of LBBG. 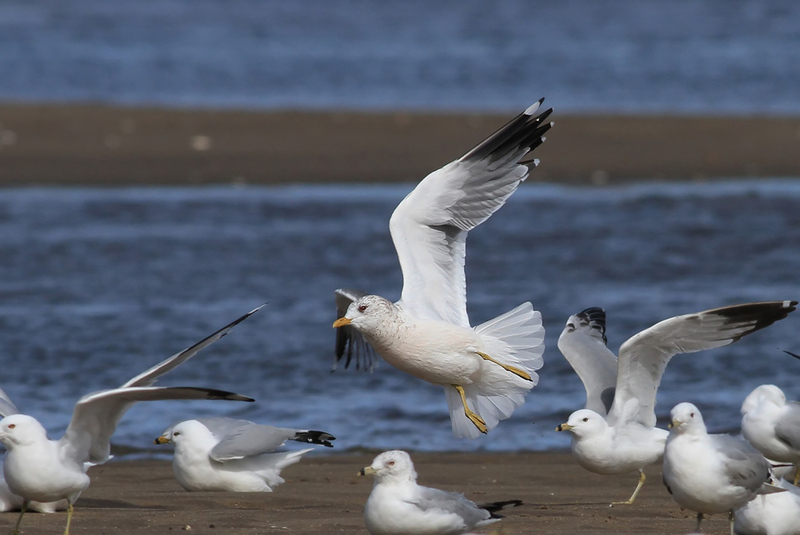 - Overall size was similar to Ring-billed Gulls but a touch larger, and it certainly had a more robust body. This was a beefy, squat, short-legged bird, oddly reminiscent of the goose-like stance often associated with Slaty-backed Gull. Lots of pro-Kam features here in plumage and structure. A couple of features that would have been nice to see, though, are: a pale iris, huge honking bill, and even more towering size compared to RBGU...though presumably these are all quite variable. 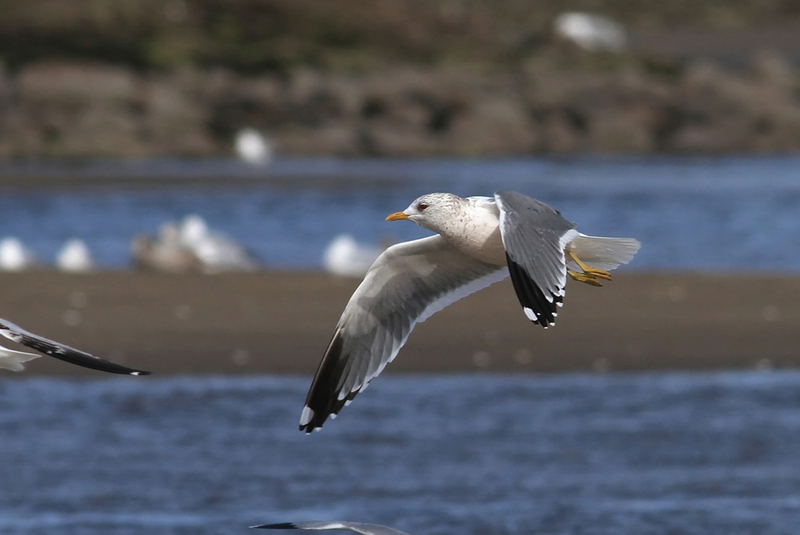 Perhaps a female Kam Gull? I honestly know very little about what heinei looks like. It is the least well-known of the subspecies. 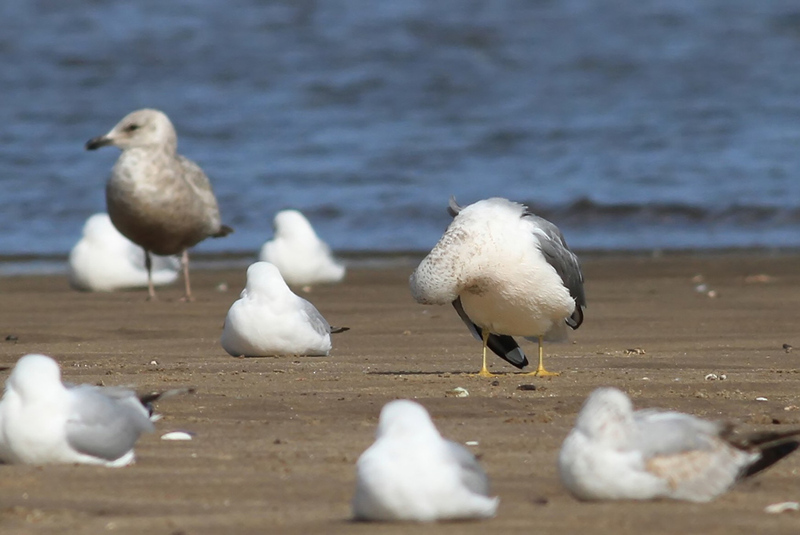 I am just assuming that, since there is interbreeding with Kamchatka Gull, the line between Kam and heinei must be blurred in some way. Can heinei overlap with both canus and kamchatschensis on either end of its range? Whatever the answer is, I do feel that this bird fits somewhere into that Asian group, and probably from east Asia. Learning more about heinei would obviously help answer these questions. I assume that Old World birders have been working on this. Canus and brachyrynchus are pretty easily ruled out I think. Among other things, this bird is too large and dark for canus with atypical head/breast markings for that form, and different primary pattern. For brachyrynchus, it is too large, too coarsely marked on the cowl, and has an altogether different outer primary pattern. The differences between this bird and these two forms are rather striking. Initial returns from abroad have all been pro-Kamchatka, though details as to why must wait for the publication of an upcoming paper in Dutch Birding. The Dutch Birding paper has finally been published, shedding some light on heinei identification criteria. Get your hands on that issue if you can - it's fantastic. This bird appears to fit solidly into kamchatschensis. The dark brown iris is an uncommon but regular feature in this form. 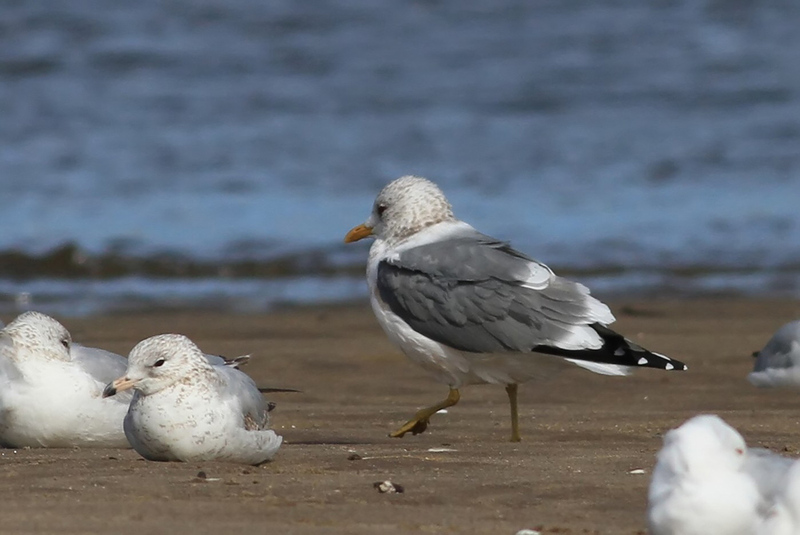 The only anomaly seems to be the extensive amount of black in the primaries overall (specifically, note the near lack of p9 mirrors and almost completely black p8), which is not right for a full adult Mew Gull of any form. As suggested by Peter Adriaens and the DB paper by him and Chris Gibbins, this would be explained if a subadult bird (perhaps third cycle?). Everything else fits to a T.